DETROIT — The Michigan Developmental Disabilities Institute (MI-DDI) at Wayne State University has taken its mission of improving the lives of families of individuals with developmental disabilities beyond Michigan’s borders. The institute recently participated in an ADA International Inclusion Fellowship offered by the Association of University Centers on Disabilities (AUCD). This initiative was funded by the U.S. Department of State, Bureau of Educational and Cultural Affairs. MI-DDI is the state of Michigan’s University Center for Excellence in Developmental Disabilities (UCEDD), part of a national network of 67 centers. The primary mission of MI-DDI is to contribute to the development of inclusive communities and quality of life for people with disabilities and their families in Michigan. The fellowship featured both “inbound” and “outbound” visits, where professionals from the United States and Peru travelled to their colleague’s respective countries. During her “inbound” visit, Fiorella Guerrero from the Universidad Peruana Cayetano Heredia in Lima spent five weeks collaborating with MI-DDI staff and other disability professionals from across Michigan. Guerrero plans to implement much of what she learned on her visit in her home country. “I brought with me books and other educational resources that, upon my return to Peru, have facilitated me to communicate the message I learned during my fellowship,” she said. One outcome of Fiorella’s inbound project was the translation of a video from the MI-DDI Possibilities series. The video – which can be viewed here https://youtu.be/4pRY6mZI1co — tells the story of Abby, a young American woman with Down syndrome. The original video can be viewed at ddi.wayne.edu/possibilities, along with all other videos in the series. In April, MI-DDI’s Angela Martin traveled to Lima, Peru, to take part in the outbound portion of the ADA Fellowship. MI-DDI is collaborating with Warmakuna Hope on a project titled Possibilities for Peruvian Children with Disabilities. Warmakuna Hope is a community-based nonprofit offering impoverished families who have children with disabilities therapeutic services and support. Warmakuna Hope seeks to establish a community-based comprehensive support center for families of children with disabilities in Manchay, Peru. This outbound project was designed to increase inclusive education and inclusive communities in Peru. Several training events were facilitated during the visit, designed to increase attendees’ knowledge on inclusive education. The content reflected the audience’s perspective: families of children with disabilities, teachers in Manchay schools, graduate schools and university faculty, and volunteers who support Warmakuna Hope. 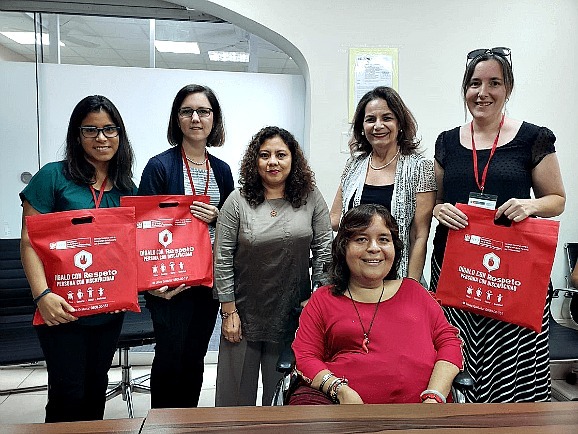 Martin and Guerrero also met with leaders at the National Council for the Integration of Persons with Disabilities or “Consejo Nacional para la Integración de la Persona con Discapacidad (CONADIS)” within the Peruvian Ministry of Women and Vulnerable Populations. This agency leads Peru’s efforts to promote the inclusion of people with disabilities and designs services and strategies to serve Peruvian citizens with disabilities. The connection made between the Universidad Peruana Cayetano Heredia, CONADIS and MI-DDI is an important outcome of the ADA Inclusion Fellowship. It paves the way for future collaboration in research, conferences and curricula to support student internships at Warmakuna Hope. Going forward, MI-DDI will work with Warmakuna Hope to develop grant proposals aimed at funding future collaboration. These future activities will include additional inclusive education training and technical assistance for Peruvian families and teachers. MI-DDI is also working to identify research opportunities for collaboration between the U.S. and Peru on topics of shared interest. These topics include inclusive education, building inclusive communities, and quality of life for individuals and families with developmental disabilities. For more information on the work and outcomes from the ADA International Inclusion Fellowship project, please visit the MI-DDI website at https://ddi.wayne.edu/events or the ADA international Fellowship Program website https://adafellowship.org/. Photo: (Left to right)) Fiorella Guerrero, WarmaKuna Hope; Angela Martin, MI-DDI; Monica Honores Incio, director, Promotion and Social Development Department at the National Council for the Integration of Persons with Disabilities; Dr. Claudia Alejandra Renteria Garces, director of the Office of Legal Advice at the National Council for the Integration of Persons with Disabilities; Isabel Vera Merea, presidential advisor, National Council for the Integration of Persons with Disabilities; Angela Bayer, public health specialist, Kuskaya program coordinator, Universidad Peruana Cayetano Heredia.